Designed with the lab technician in mind, Medica’s blood gas analyzer products use straightforward modular designs. 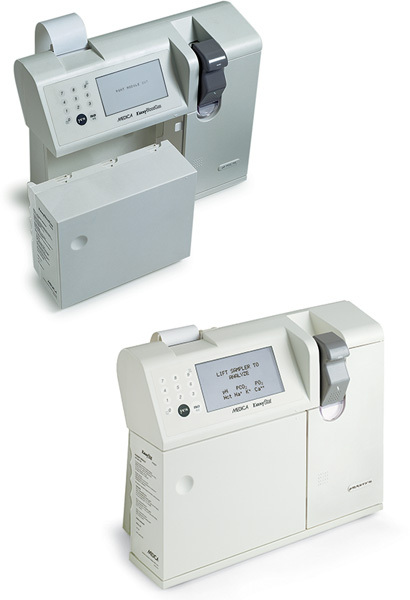 These analyzers employ simple user interfaces and have a low cost per sample. All analyzer components are combined into simple modules that are easily accessible to the user. Routine maintenance is limited to the replacement of the reagent module, electrodes, and a single pump tube. With quick start up and training, lab technicians will immediately benefit from Medica blood gas analyzer accuracy, reliability, and productivity. Medica’s EasyBloodGas™ is designed to address the laboratory’s need to economically deliver sample results. A compact electrode design and precise control of calibrator volumes ensure the lowest cost per sample. EasyStat® is the affordable way to increase a laboratory’s capability. EasyStat saves time, money, and bench space. The small footprint allows the instrument to be used in virtually any laboratory workflow.